I have been trying to convince people (colleagues, professionals) that climate adaptation is an area where demand will only grow. Unfortunately, the climate change debate has muddied the issue in people’s minds. The debate is largely about the causes of climate change (anthropogenic or not?) and perhaps whether or not specific climatic events are part of a trend. But most people agree that changes are occurring. Planning for adaptation to an already changing climate is lagging far behind where it should be because of the contentious politics. But the changes themselves, from rising sea levels to urban heat-related mortality to failing stormwater infrastructure, will force a response at the scale at which the problem is most acute – the LOCAL level. Unlike the hard sell for mitigation efforts (you MUST change your behavior! ), adaptation needs will create their own demand for a response. Cities are uniquely positioned to deal with climate challenges because they have the most detailed knowledge of local conditions and the needs of their citizens. The concentration of people and economic activities in cities means that managing the impacts of climate change, which range from rising sea levels to increasing extreme weather events, is essential to avoid human and economic losses. And he gives the example of Boston, a city that is well ahead of most other U.S. cities in terms of adaptation planning. the City of Boston, USA, has been actively addressing climate adaptation and promoting climate action amongst its citizenry. In 2010, Boston published Sparking Boston’s Climate Revolution, which presented to Mayor Thomas Menino recommendations on green development mechanisms and urban adaptations to sea level rise, expanded flood zones, and more frequent heat waves. The City followed that up by publishing A Climate of Progress: City of Boston Climate Action Plan Update 2011 to highlight how city departments have started putting these recommendations into effect. 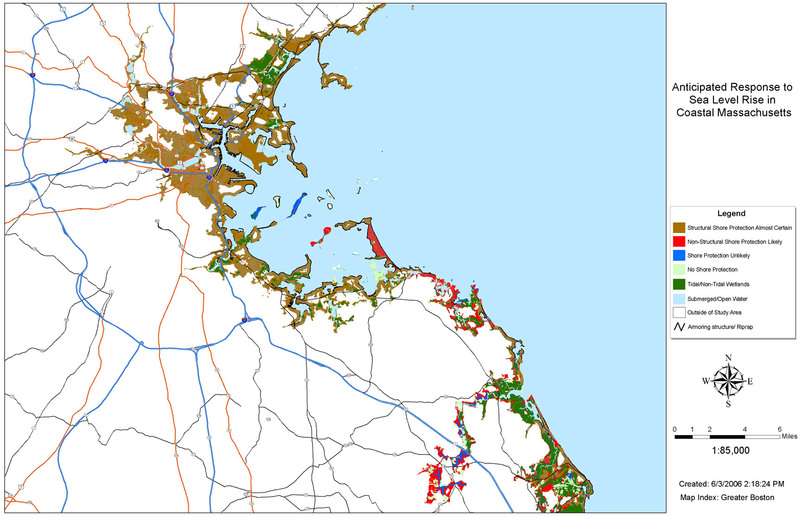 Why Boston cares – Map from the Sea Level Rise Planning Maps site.